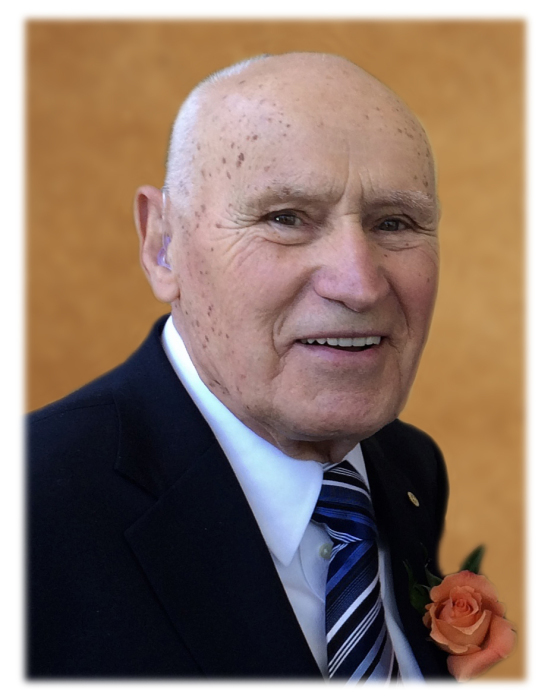 Stanley H. Adams, born July 16, 1921 in Elcor, Minnesota, died peacefully at The Cleveland Clinic surrounded by family and friends on Monday, April 8, 2019. He was 97. He is survived by his nine children, Marie (Michael) Rehmar, Laverne (Michael) Kaminski, Stanley L. Adams, Sharon (Jay) Molvie, Delbert L. (Gina) Adams, Karin A. Eisenhardt, Luke B. Adams, Alice (Steve) Hoffarth, and John F. Adams; 20 grandchildren and eight great-grandchildren. Stanley was preceded in death (1965) and remained connected to his beloved wife of eighteen years, Doris Birtic Adams, who distinguished herself as the first Slovenian woman attorney in America. Stanley served as an Ordnance Officer and expert sharpshooter in the United States Army in World War II stationed in the Pacific theater: New Guinea and the Philippines earning two Bronze Stars. He was an active member of the Rotary Club of Cleveland for over 35 years, enjoying perfect attendance for the majority of his membership. Stanley was one of the three founding members of the Rapid Recovery Project which was a beautification project sponsored by the City of Cleveland and promoted by the Rotary Club of Cleveland. It involved clean up and maintaining a three mile stretch of property along the RTA Rapid Transit train track right of way near the West 25th Street station in Cleveland. Stanley was recognized by government officials and the Rotary Club of Cleveland for his exemplary leadership in this project. He served on various committees and was a Paul Harris Fellow and an Honorary Past President of the Rotary Club. Stanley was also a member of the American Legion and Veterans of Foreign Wars. Stanley retired from a 55 year career at Nationwide Insurance in his mid-80’s after serving multi-generations of policyholders meeting their personal, property, casualty and life insurance needs. He also partnered with his wife to form Standor Realty, owning and managing residential real estate throughout Cleveland. Stanley was a Roman Catholic and a member of St. Louis Parish (Cleveland Heights). He volunteered with the church’s work with homeless as well as helping with the landscaping and beautification of the church grounds. More recently, Stanley attended services at Laurel Lake Retirement Community in Hudson, OH and St. Philomena Church in Cleveland, OH. “Stanley was a leader among leaders and an inspiration to all who had the privilege to know him. He was the personification of Rotary's motto - Service Above Self - dedicated and committed throughout his life to giving back to those less fortunate. He was kind and generous and a true gentlemen...and loved his family above all else. When he entered a room, his smile would brighten everyone's day,” remarked Beverly Ghent-Skrzynski, Rotary International District Governor, Northeast Ohio. He was a special person who enriched the lives of his family and his community. Stanley was the consummate volunteer. If someone was in need, he was always the first person to show up to help (and the first to disappear so that others would be recognized for the aid provided). Put simply, he put his hands where his heart and head were. He worked quietly, behind the scenes, and with little fanfare as he put his fingerprints on many projects throughout the city of Cleveland. Many would say that he transformed an area of need overnight with his untiring efforts. Stanley enjoyed traveling, camping, and was a winter sports enthusiast, assisting in the formation of the Cleveland High School Ice Hockey League in the late 60’s. Friends may call at the SCHULTE AND MAHON-MURPHY FUNERAL HOME, 5252 MAYFIELD RD. (BETWEEN RICHMOND AND BRAINARD), LYNDHURST FOR VISITATION ON SUNDAY FROM 2-6 P.M. All are asked to gather at St. Philomena Church of Communion of Saints Parish, 13824 Euclid Ave., East Cleveland on Monday at 10 a.m. to celebrate Stanley’s Mass of Christian Burial. Interment Calvary Cemetery. In lieu of flowers, memorial contributions are suggested in his name to the Stanley H. Adams “Service Above Self Memorial Award” c/o Cleveland Rotary Foundation, 377 Lear Rd, Suite 222, Avon Lake, OH 44012 (Please draft checks payable to the Cleveland Rotary Foundation). Please consider spending time with a senior to make a day extra special for him or her!